The low-cost and user-friendly 3D printer can make a teacup in just an hour. Creators of The Micro, world's "First truly consumer 3D printer", have raised an amazing $1,440,360 (at the time of writing this article) through the crowd funding site Kickstarter within a day of its launch on the site. 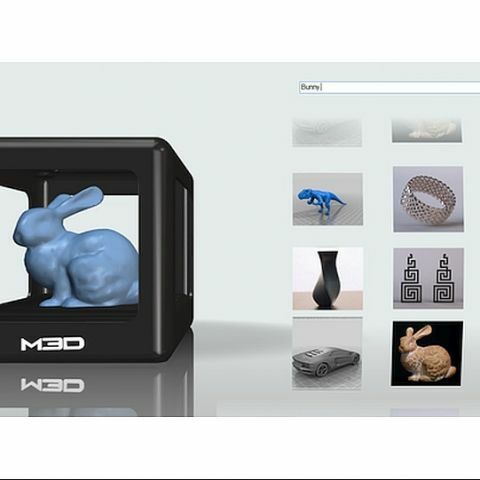 M3D the company behind the 3D printer aims to bring the technology to masses and says that it has designed the printer with 'reliability, consistency, and accessibility' in mind. The 3D printer is very affordable and is meant for beginners and experts alike. You just need to plug in the printer, download or create models and hit print. To make the printer cheaper, Armani, CEO of M3D, and his team reduced the power that The Micro needs to run on. Armani adds, "When you reduce the power consumption, the price of everything drops. It's like a cascade reaction: now you need a smaller power supply and smaller wires. Now you don't have to spend so much on protection circuitry." The Micro is a consumer-friendly printer that has plug and play features. The device will be shipped as ready-assembled, and comes with built-in auto-leveling and auto-calibration, so it can keep printing without any user intervention. The printer comes with filament spools that can fit inside the box and improves portability and design. The printer can take PLA or ABS, or a standard 1.75 mm filament spools available in the market as well as M3D's own filament spools. It also comes with companion software that is easy to use with touchscreen and supports drag and drop functions. "The dream here is definitely that you take something and install it as fast as the fastest plug-and-play device that you've ever seen and you're focused on the end result," Michael Armani, M3D's CEO says. "You take the design, put it in the printer, it prints as quickly as possible. The focus here isn't on the 3D printing process ... [it's] on 'yeah, I want to make a mold for chocolates.' It went to the fun part so you can enjoy it as much as possible." M3D plans to begin production of The Micro between August and September this year and plans to deliver the orders by March next year. The Micro costs $249, but if you want to get the one from the first pre-production batch you would need to spend $899. Another low-cost 3D Printer called the Deltaprintr received funding from Kickstarter. The Deltaprintr has been developed by Shai Schechter, a student from State University of New York and costs $475. The printer also got a lot of interest from backers and raised over $236,000 on Kickstarter. Recently, Angad Daryani, a 15 year old Indian student is also built 'Sharkbot'- a low cost 3D printer. Daryani plans to launch the printer in the next 2 months and says the printer will cost as low as Rs.20,000. Can i install a E-ATX motherboard on a case which support Micro-ATX, ATX, XL-ATX ?